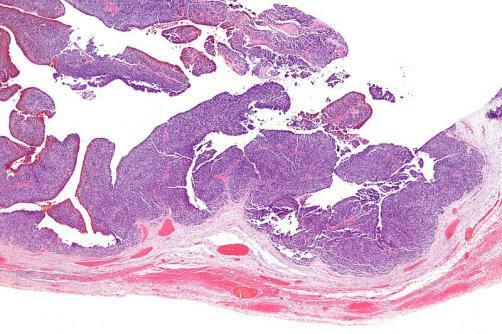 Transitional cell carcinoma of the ovary. IMAGE: Nephron. A treatment that specifically targets ovarian cancer cells has shown that half of women who took the drug experienced shrinking of their tumours. In the cases where women possessed a particular molecular target, seven out of ten women were found to respond positively. The drug trial is still in its very early stages, coming as it does as part of Phase 1 trials into the drug. The trial consisted of 15 women and was set up to determine its safety in humans, as opposed to attempting to display therapeutic effect. However, the drug, known as ONX-0801, was able to show immediate improvements to seven women on the trial who had undergone all other forms of treatment. The treatment functions by mimicking folic acid to enter cancer cells; once this has happened, the drug is able to kill the cell by blocking a molecule called thymidylate synthase, which then causes irreparable DNA damage. This targeted method of treatment means that healthy cells are not damaged as part of the treatment. As a result, the drug is able to produce its effects without the negative side-effects that arise as part of a regimen involving chemotherapy. As Workman mentions latterly, there are still far more trials for the drug to undergo before it can become routine treatment. There are worries that the drug may have safety risks if taken for more than a few months at a time. However, this will be discovered as more research and more trials are conducted. The overall impression is that the drug holds a lot of promise for treatment, particularly for those women have no other options left. The news comes as positive news for the company that owns the compound, Amgen, and its subsidiary, Onyx Pharmaceuticals, that is developing the drug.